If you have been asking lately, Kota Kinabalu is the most ideal place to generate energy through solar PV. Sadly though, we do not enjoy the same premium rate enjoyed by our counterparts in West Malaysia through the FiT Scheme. Reason - because we do not pay the 1% levy on our electricity bills. Colour coding of the solar irradiance in Malaysia. Darker is better. Kota Kinabalu and Sabah, in general, together with Penang are the best two spots to produce electricity from sunlight, according to Ahmad Hadri Haris, former Head of the Renewable Energy Unit, Pusat Tenaga Malaysia (Malaysian Energy Centre). Ahmad Hadri is currently the CEO of Malaysian Green Technology Corporation (GreenTech Malaysia) after his appointment on April 1, 2013. "In terms of the amount of sunlight we can capture, Kota Kinabalu measures 1,800 kWh/metre square per year compared to 1,500 in the Klang Valley"
Global horizontal irradiation - Solar. For this reason, a solar energy producer in KK can actually produce up to 30% more electricity than the guy in KL, Ahmad noted. He was speaking in conjunction with the 32nd International Energy Agency Meeting in Kota Kinabalu, back in 2009. Irradiation is the sum of irradiance over a time period (e.g. 1 hour, day, month, year, etc.) expressed in J/m2. However, in daily routine Wh/m2 are more commonly used. 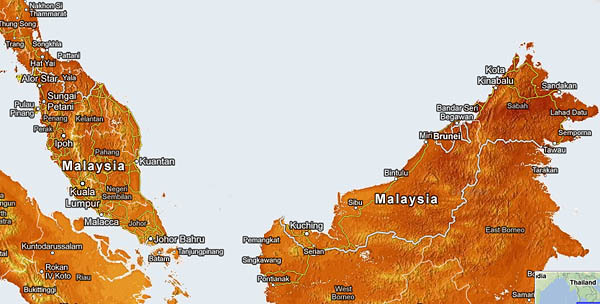 The above solar irradiation maps can be found at SolarGis website.